Many years ago, we used to enjoy fresh air (which was much less polluted) and fresh water (which could be directly consumed from taps). However, with globalization and urbanization, these two basic necessities have now become a distant dream. You can still enjoy fresh air & fresh water, but that is only possible in the comfort of your home. You may need an air purifier at home so you and your loved ones can breathe fresh air. On similar lines, the direct consumption of tap water is no longer a healthy option. Water in natural resources like rivers, lakes, ocean, etc. are polluted as they might contain Colloidal Impurities. Some of the Colloidal Impurities in water are organic waste products and amino acids. Some of the impurities that are present in water are Colloidal matter and Suspended solids. It can contain viruses, bacteria, mud, clay, sand, etc. Consuming water which has even a few of these impurities can lead to an adverse effect on the health and may result in water-borne diseases. So, what can you do about this serious problem? You need to get rid of all these impurities before consuming the water. Many people feel that boiling the water removes all the harmful bacteria present in the water, but that it is only a myth. It is not a foolproof approach. 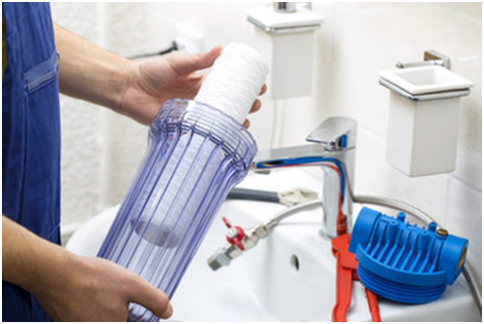 Instead, you should use a water filter or water purifier depending on your budget & water storage requirements. Taking about water filters, they are considered to be a more economical option but they do not remove all the impurities in the water. Water filters can remove the harmful chemical substances present in the water and some filters may even remove the flavor & smell of the water. Though they can remove the harmful ingredients in the water, water filters still cannot manage to purify the water to the fullest. The other downside of using a water filter is constant maintenance required for cleaning up the bacteria that gets accumulated on particle fiber filters & ceramic filters. A better & long-lasting option is using a water purifier, particularly RO purifier since it is capable of removing all the impurities present in the water. RO purifier is based on the Reverse Osmosis purification technique. Reverse Osmosis (RO) purification process is a very simple & straightforward process where the water is purified by application of water pressure which pushes the incoming tap water through a semi-permeable membrane. RO purifiers are very popular since they are capable of removing even the dissolved inorganic solids e.g. excess amount of salts present in the water. Some of the impurities that are removed by RO water purifiers are Lead, Fluoride, Pesticides, Nitrates, Sulfates, etc. Best water purifier from companies like Livpure even come equipped with multi-staged filtration pipeline which ensures that not even a single impurity passes through the membrane. RO water purifiers from Livpure also have taste enhancers where the purifier also improves the taste of the water without getting rid of the healthy ingredients present in the water. You also have the option to purchase RO water purifiers which have UV (Ultra Violet), UF (Ultra Filtration), and Total Dissolved Solids (TDS) controller. There are options for enterprises where the storage capacity of the water purifier is much more as compared to a RO purifier (which is used for homes).